It’s Saturday morning in Ghusel, Nepal. The rising sun casts light upon an expanse of makeshift shelters—a sea of bamboo, wood and tarpaulins. When the devastating earthquake shook Nepal last April, all but five of the 355 houses in Ghusel were reduced to rubble. The physical impact of the quake is still visible. It is the emotional damage—post-traumatic stress, anxiety and depression—that is more difficult to spot. Yet it is a significant and challenging burden for many earthquake survivors. Krishna Kumari Mahat is one such survivor. For the past few months, she has found a way to manage her worries. In the spirit of her community, Krishna Kumari has found her support system. PWS&D supports a program in Nepal—through the ACT Alliance—that offers psychosocial assistance to individuals living in five districts affected by the earthquake. The program’s aim is to take people’s minds off the earthquake—and the struggles they have faced since—and to help them freely express their thoughts and emotions. The program equips village leaders to counsel and support the people of Ghusel. But it also facilitates a variety of community-based activities such as singing workshops, sports, art and musical activities. Krishna Kumari attends a singing workshop twice a week. The opportunity to express herself has been transformative. 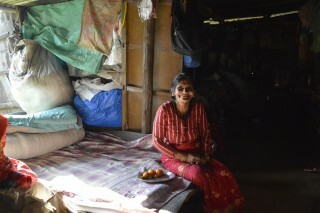 But for Krishna Kumari it is the encouragement of other survivors that has helped her embrace hope and cast away fear.